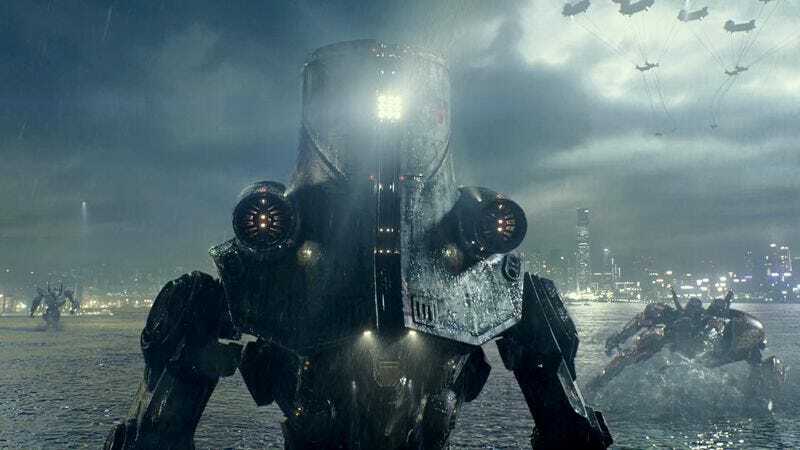 Guillermo del Toro is currently working on the sequel to his 2013 monsters-on-mecha boxing movie Pacific Rim, and spoke with Collider about what fans can expect when Pacific Rim 2 hits theaters. “What happens to the Jaeger technology once the Kaiju are not a threat?,” asks del Toro, confirming that the skyscraper-sized monsters do not play the same menacing role in the sequel. Confident that comic relief will fill the void left by giant, punchable monsters, del Toro explains that Pacific Rim’s bickering scientists (Charlie Day and Burn Gorman) will become more central to the story. “They are probably the guys I have the most fun writing,” says del Toro. Fans of Pacific Rim’s leviathan knockouts shouldn’t completely lose hope, however. The director says that Kaiju will appear in a different form, and that other characters return at the end of Pacific Rim 2 to set up events that will pay off in Pacific Rim 3. If all this is true, Jaegers lying fallow in an era of peacetime would create the perfect conditions for Kaiju to make a dramatic return, compelling the Jaegers to undertake a Frank Stallone-scored training montage. Pacific Rim 2 opens in theaters on April 7, 2017.